Learmonth White Dalrymple was the daughter of William Dalrymple and his wife Janet, and was baptised at Coupar Angus at the end of July 1827. Learmonth did not have an easy childhood as her mother’s death, in 1840, meant that much of the daily tasks of caring for the family fell to her (she was the oldest child). It is not entirely clear what prompted the family to move to New Zealand, but as Page notes in Learmonth’s biography, she set out in 1853 ‘with her father, two sisters and a brother’. Initially the family stayed in Dunedin, then went north to Wellington, only to return to Otago by the latter half of the 1850s to make home there for good. When the Otago Boys’ High School opened in 1863, a leader in the Otago Daily Times, probably by Julius Vogel, urged a ‘companion institution’ for girls. This set Learmonth Dalrymple on a seven-year-long campaign, waged with discreet persistence, for girls’ secondary education in Otago. She first appealed to her neighbour and friend, Major J. L. C. Richardson, speaker of the provincial council, initiating a fruitful collaboration in the cause of female education. Richardson advised her to ‘go into town and get up a Ladies’ memorial to the Council’. Meanwhile he himself moved a resolution there urging the submission of a scheme for girls’ education to the next session. This resolution was unanimously affirmed. The ‘Ladies’ memorial’ was less successful. It pointed out how ‘inadequate and inefficient’ were the existing facilities for girls’ education and proposed setting up a school especially for ‘the middle and wealthier classes of the colony’. Although moderately worded, its reception was mixed and the council took no action on it. This first phase of the agitation culminated in a public meeting of about 30 women in November 1865. It opened with due decorum, but a series of interruptions, from press reporters, a breathless woman with news of a buggy accident, and a German band outside the windows, turned it into pure farce and caused its abandonment. The campaign revived before the end of the decade, largely owing to the quiet perseverance of Learmonth Dalrymple, now living nearer to Dunedin, at Port Chalmers. As well as fostering an informal group of Dunedin women supporters, she wrote some 700 or 800 letters to British educationalists and local politicians. In 1868, at her instigation, Provincial Treasurer Julius Vogel tried unsuccessfully to put £1,000 on the estimates, for a girls’ school. She then looked higher, winning over Superintendent James Macandrew, who called for proposals from the education board, and in 1869 set up an education commission chaired by the Reverend D. M. Stuart and including nine provincial council members. Learmonth Dalrymple promptly formed a ladies’ committee, and as its secretary she wrote to the commission specifying what kind of school was desirable. Her ideas were based on advice from Frances Buss, famous principal of North London Collegiate School for Girls. She recommended that girls’ education should ‘in all essential points…be assimilated to that of boys’. The proposed school should have adequate buildings, be in the charge of ‘a lady, un-married, or a widow, of attested talents and acquirements’ and ’embrace all the branches included in the term “thorough English Education,” ‘ as well as physical training. Fees should be £10 per annum, the school day should open with prayer, and there should be accommodation for boarders. The commission incorporated these suggestions in their report to the provincial council. A principal, Margaret Gordon Burn, was appointed and Otago Girls’ High School opened on 6 February 1871 with 78 pupils, the number rising to 130 by the end of the year. 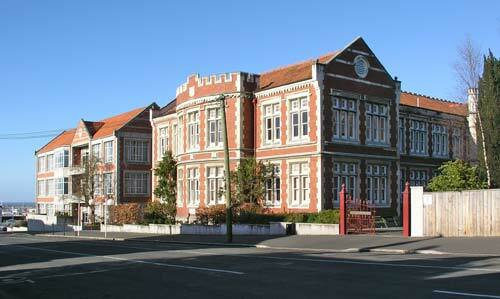 Hence had been established, the first public girls’ high school in the Southern Hemisphere – a school that offered girls in Otago a formal education to prepare them for tertiary education and continues to do so to this day. Successful as this cmapaign had bee, Learmonth continued her work towards improving a ccess to education at all levels for girls. In particular she was, in the early 1870s, devoting her time to making sure that women too would be admitted to the University of Otago, which was planned to be established in Dunedin. Thanks to her lobbying skills and the support of many other Otago women, this endeavour too was successful, with the University Council agreeing to admit women. This was another first as the University of Otago thus became the first university in Australasia frame its admission policy in this open and un-gendered way. Later in her life Learmonth became interested in the Women’s Christian Temperance Union, which was also campaigning for women’s franchise. Learmonth died in Dunedin on 26 August 1906, but was buried at Palmerston North (North Island – her brother lived nearby).